I love designing with pearls and crystals, as well as Delica beads. My Delica patterns have a heavy African influence, because I grew up there, and have always loved the different cultures and wildlife. Everything around me--I see patterns in most things. I love Art Deco and I wanted to make a design of something that was not immediately obvious to the eye. When I started drawing fish, the rest of the design just fell into place. I started about four years ago when I went to visit family in South Africa. I bought a Zulu-style bracelet and decided to take it apart to see how it was stitched. I paint in watercolors, I do silk and leather painting and I carve designs on ostrich eggs and turn them into lamps. The site was recommended by a friend. I belong to various Yahoo beading groups. Beading relaxes me, but also keeps my brain creative. At the moment, I can only do it part-time because I help my husband run his electrical business. 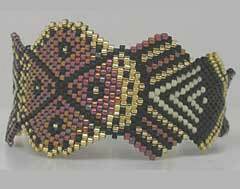 I have my own website to sell my bead patterns. I occasionally donate patterns when asked, for charitable causes. The only limit to creation is imagination.